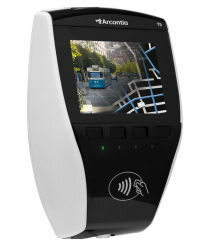 ARC3300 T5 is an interactive contactless validator that offers fast and convenient ticket validation, smart card reload and contactless payments across public transport. The ARC3300 T5 validator houses an integrated ISO/IEC 14443 A/B reader, a 5.7" TFT color touch display, four physical buttons, four color LED lights and an audio buzzer. The validator comes with a comprehensive software development kit for quick and easy development and integration with different ticketing and payment applications, as well as supporting the latest MIFARE AV1 and MIFARE AV2 SAMs. ARC3300 T5 is available with Ethernet, GPRS or Power over Ethernet (PoE). T5 is suitable for high frequency contactless applications that require fast transactions and quick passenger throughput. 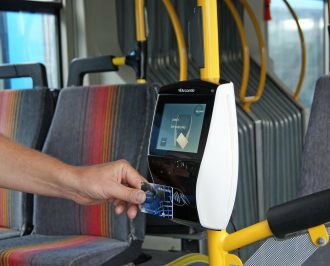 As passengers and drivers do not handle cash, boarding times are reduced, speeding up the flow of travelers and allowing the bus or tram to be on time.